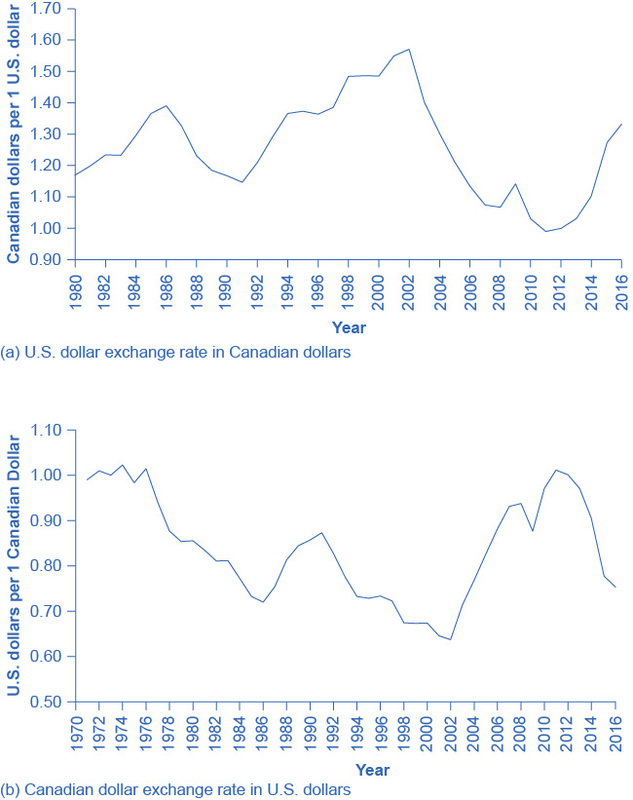 To illustrate the use of these terms, consider the exchange rate between the U.S. dollar and the Canadian dollar since 1980, in Figure 1(a). The vertical axis in Figure 1(a) shows the price of $1 in U.S. currency, measured in terms of Canadian currency. Clearly, exchange rates can move up and down substantially. A U.S. dollar traded for $1.17 Canadian in 1980. The U.S. dollar appreciated or strengthened to $1.39 Canadian in 1986, depreciated or weakened to $1.15 Canadian in 1991, and then appreciated or strengthened to $1.60 Canadian by early in 2002, fell to roughly $1.20 Canadian in 2009, and then had a sharp spike up and decline in 2009 and 2010. In May of 2017, the U.S. dollar stood at $1.36 Canadian. The units in which we measure exchange rates can be confusing, because we measure the exchange rate of the U.S. dollar exchange using a different currency—the Canadian dollar. However, exchange rates always measure the price (or value) of one unit of currency by using a different currency. In looking at the exchange rate between two currencies, the appreciation or strengthening of one currency must mean the depreciation or weakening of the other. Figure 1(b) shows the exchange rate for the Canadian dollar, measured in terms of U.S. dollars. The exchange rate of the U.S. dollar measured in Canadian dollars, shown in Figure 1(a), is a perfect mirror image with the exchange rate of the Canadian dollar measured in U.S. dollars, shown in Figure 15(b). A fall in the Canada $/U.S. $ ratio means a rise in the U.S. $/Canada $ ratio, and vice versa. This video explains how the exchange rate is determined using supply and demand. With the price of a typical good or service, it is clear that higher prices benefit sellers and hurt buyers, while lower prices benefit buyers and hurt sellers. In the case of exchange rates, where the buyers and sellers are not always intuitively obvious, it is useful to trace through how different participants in the market will be affected by a stronger or weaker currency. Consider, for example, the impact of a stronger U.S. dollar on six different groups of economic actors, as shown in Figure 2: (1) U.S. exporters selling abroad; (2) foreign exporters (that is, firms selling imports in the U.S. economy); (3) U.S. tourists abroad; (4) foreign tourists visiting the United States; (5) U.S. investors (either foreign direct investment or portfolio investment) considering opportunities in other countries; (6) and foreign investors considering opportunities in the U.S. economy. Figure 2. How Do Exchange Rate Movements Affect Each Group? Exchange rate movements affect exporters, tourists, and international investors in different ways. The preceding paragraphs all focus on the case where the U.S. dollar becomes stronger. The corresponding happy or unhappy economic reactions are illustrated in the first column of Figure 2. The following feature centers the analysis on the opposite: a weaker dollar. Let’s examine the effects of a weaker dollar in various scenarios. Scenario 1: What will happen to the price of a Ford pickup truck in the U.K. if the value of the dollar weakens? First, we note that the demand for U.S. exports is a function of the price of those exports, which depends on the dollar price of those goods and the exchange rate of the dollar in terms of foreign currency. For example, a Ford pickup truck costs $25,000 in the United States. When it is sold in the United Kingdom, the price is $25,000/$1.50 per British pound, or £16,667. The dollar affects the price faced by foreigners who may purchase U.S. exports. Next, consider that, if the dollar weakens, the pound rises in value. If the pound rises to $2.00 per pound, then the price of a Ford pickup is now $25,000/$2.00 = £12,500. A weaker dollar means the foreign currency buys more dollars, which means that U.S. exports appear less expensive. From this, we conclude that a weaker U.S. dollar leads to an increase in U.S. exports. For a foreign exporter, the outcome is just the opposite. Scenario 2: How does a depreciating dollar affect the exchange of British beer in the United States? Suppose a brewery in England is interested in selling its Bass Ale to a grocery store in the United States. If the price of a six pack of Bass Ale is £6.00 and the exchange rate is $1.50 per British pound, the price for the grocery store is 6.00 × $1.50 = $9.00 per six pack. If the dollar weakens to $2.00 per pound, the price of Bass Ale is now 6.00 × $2.00 = $12. We can conclude that from the perspective of U.S. purchasers, a weaker dollar means that foreign currency is more expensive, which means that foreign goods are more expensive also. This leads to a decrease in U.S. imports, which is bad for the foreign exporter. Scenario 3: How does a weaker dollar affect U.S. tourists traveling abroad? U.S. tourists going abroad face the same situation as a U.S. importer—they are purchasing a foreign trip. A weaker dollar means that their trip will cost more, since a given expenditure of foreign currency (e.g., hotel bill) will take more dollars. The result is that the tourist may not stay as long abroad, and some may choose not to travel at all. 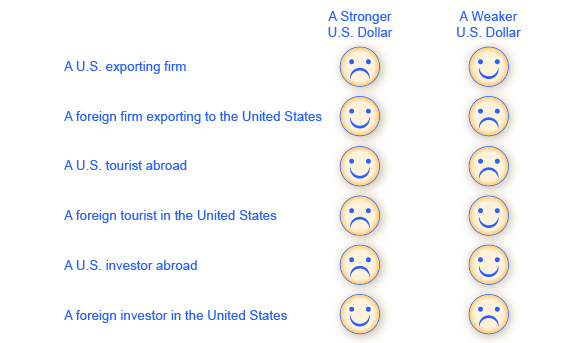 Scenario 4: How does a weaker dollar affect foreign tourists traveling to the United States? Consider that, for the foreign tourist to the United States, a weaker dollar is a boon. It means their currency goes further, so the cost of a trip to the United States will be less. Foreigners may choose to take longer trips to the United States, and more foreign tourists may decide to take U.S. trips. Scenario 5: How does a weaker dollar affect investments? A U.S. investor abroad faces the same situation as a U.S. importer—they are purchasing a foreign asset. A U.S. investor will see a weaker dollar as an increase in the “price” of investment, since the same number of dollars will buy less foreign currency and thus less foreign assets. This should decrease the amount of U.S. investment abroad. Foreign investors in the Unites States will have the opposite experience. Since foreign currency buys more dollars, they will likely invest in more U.S. assets. At this point, you should have a good sense of the major players in the foreign exchange market: firms involved in international trade, tourists, international financial investors, banks, and foreign exchange dealers. The next section demonstrates in more detail how the tools of demand and supply can be used in foreign exchange markets to explain the underlying causes of stronger and weaker currencies. Watch this video to practice analyzing the impact of shifters on supply and demand in the foreign exchange market.